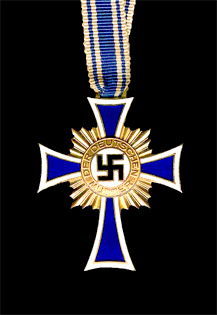 On August 12, 1938, Adolph Hitler introduced the Mother’s Cross as an incentive for German women to produce as many children for the Third Reich as possible. The date was chosen to honor his mother Klara every year on her birthday. A gold medal was presented to mothers with seven children, a silver to mothers with six children, and a bronze to those with a mere five. Once young German women turned 18 and were graduating from the Hitler Youth movement, they became eligible for an offshoot of the League of German Girls called Faith and Beauty. The purpose of this organization was to teach young girls how to be ideal Aryan mothers. Of course, one of the most important components of being an ideal mom was popping a bunch of kids out as quickly as possible. Another method the Nazis used to promote the creation of families and obedience to the state was the introduction of the Law for the Promotion of Marriages, which was a smaller statute contained within the Law for the Reduction of Unemployment. Initially, this legislation was intended to reduce male unemployment by shoo-ing women back home to their domestic duties, as it should be…. When that backfired and labor shortages resulted, it morphed into a loan program that rewarded young couples for marrying and having families. Of course, if Klara Hitler had stopped short on lucky child number 3, rather than going on to number four- little Adolf- few would be shedding any tears over it today. Although, to be fair, her first two children died of diphtheria at 2 years old and 1 year old respectively, and lucky number three only made it to three days old. Incidentally, her fifth only made it to 6 years old, dying of the measles… After birthing six children, only two made it to adulthood. Child rearing in more modern times sure is a lot nicer experience. In any event, the Nazis not only heavily restricted birth control; they also made access to abortion almost impossible. Himmler established the Central Agency for the Struggle Against Homosexuality and Abortion in 1936. Six years later, the death penalty could be sought against women who had abortions in “extreme cases.” Birth control centers were closed by the police, and the advertising of contraceptive devices was strictly controlled by the government. The only abortions allowed in Nazi Germany were ones involving “unhealthy” children, as defined by the notorious Law for the Prevention of Hereditary Diseased Offspring, and of course, Jewish children. In both cases, it was perfectly acceptable to abort, as it was in the best interest of the German people to do so.